Description - A large, robust falcon, The Peregrine Falcon is slate-grey above and pale below, with fine black bars and spots. The head is hooded with black and has a wide black "moustache". Young birds are brown or brownish-slate above and heavily streaked below. Usually a silent bird, a rasping "kack-kack-kack-kack" can be heard while nesting. Distribution - The Peregrine Falcon breeds from Alaska and the Canadian Arctic, south through the mountainous west and sparingly in the east, wintering coastally, north to British Columbia. They prefer open country, especially along rivers and lakes and occasionally in cities. Biology - During the 1950's and 1960's a pesticide was used that caused the eggshell to thin, drastically declining the population of the Peregrine Falcon. Since then this pesticide has been banned and this falcon's numbers are increasing again. 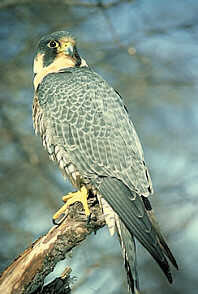 They survive chiefly on birds, rodents and insects; in urban areas the Peregrine subsists mainly on pigeons. This bird lays its 2-4 cream or buff coloured eggs with reddish-brown spots in either an abandoned bird's nest or on a cliff or building ledge.